Trade liberalization: how good is it for workers? How does increased openness to international trade affect workers’ wages and job security? This question is central to the public debate concerning the effects of globalization, but convincing quantitative answers have been difficult to come by. One fundamental reason is that major trade liberalization episodes have often coincided with labor reforms (Heckman and Pages 2004). Colombia is a case in point. As figure 1 shows, this country experienced deindustrialization, higher job turnover rates, and heightened wage inequality in the years following its 1986-1991 trade liberalization. But these outcomes were also plausibly affected by the labor market reforms of 1991, which made it easier for firms to lay off workers. To unbundle the effects of globalization from those of labor market reforms, we formulate a rich model of labor and product markets with the following features: each period, workers choose between a guaranteed but low-paying job in the non-tradable sector and searching for a job in the manufacturing sector. Manufacturing jobs pay higher wages in expectation, but searching for them involves unemployment risk. The job finding probability, in turn, is endogenously determined by the hiring and firing decisions of manufacturing firms. Those firms that experience positive productivity shocks engage in costly search for more workers, while firms experiencing negative shocks pay the severance costs of laying workers off. When a worker is lucky enough to find an industrial employer, the two sides negotiate a wage and form an employment relationship. And since expanding firms have more rents to share with their workers, they pay their employees higher wages. This wage premium is larger for firms that are big enough to profit from exporting, since access to foreign customers increases workers’ marginal revenue product. These modeling components draw on a number of recent papers in the trade and labor literature. Our contribution is to combine them in a structural empirical model that supports policy analysis. First, we estimate the parameters of our model using establishment-level panel data from Colombia. In doing so we successfully replicate measures of wage inequality, job volatility, firm entry and exit rates, the size and growth rate distributions of firms, and the revenue premium associated with exporting (inter alia). Then we use the estimated model to isolate the effects of globalization and labor market reforms on Colombian labor market outcomes. Our counterfactual experiments yield several interesting results. First, the reductions in trade frictions that Colombia experienced induced productive, up-and-coming firms to grow faster and pay even higher wages as they expanded into export markets. These reductions also induced unproductive firms to contract and lower their wages in the face of heightened competition from abroad. Combined, these adjustments increased cross-firm wage inequality, shifted the firm-size distribution rightward, and increased job turnover. Second, the effects of Colombia’s trade liberalization were not nearly as important as the globalization forces that took place beyond Colombia’s borders, including growth in foreign demand, improved communications, and reductions in shipping costs. Finally, reductions in firing costs increased the sensitivity of firms’ labor demand to their changing conditions, both by encouraging unproductive firms to contract, and by making firms with good productivity draws less cautious about expanding. However, a more subtle effect of reduced firing costs largely offset the associated increase in job turnover. Specifically, since firms can avoid firing costs by shutting down entirely, reductions in these costs dampened job destruction by encouraging marginally profitable firms to stick around. 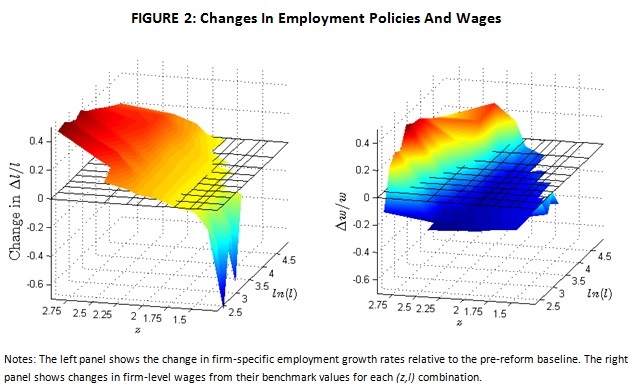 Figure 2 (figure 5 from the paper) depicts the shifts in firms’ employment policy (left panel) and wage levels (right panel) from the pre-reform period to the post-reform period. In each panel, the variable z shows the productivity of a firm and ln(l) shows the logarithm of its employment level (size). Clearly, employment policies become more sensitive to firms’ productivity while wages become more sensitive to firms’ employment levels. Among other things, these adjustments reflect the effect of better access to export markets. That is, with globalization, small, productive firms gain more by expanding into these markets, so they hire more aggressively in order to do so. Further, they share the associated revenue gains with their workers. This increases wages in productive and large firms relative to the pre-reform period (right panel). What are the welfare implications of these results? Despite increased cross-firm wage inequality and job volatility, we find that the average real income of Colombian workers went up. The mechanisms behind these gains are standard: trade increases the number of varieties available for consumption and thus reduces the real price index. It also leads to aggregate productivity gains due to labor reallocation across firms, as in Melitz (2003). But two important caveats apply. First, the gains from globalization accrue to the employees of larger, more productive firms, which are in a position to benefit from better access to foreign markets. Workers at smaller less productive firms suffer welfare losses. Second, the increase in average welfare associated with globalization partly reflects our assumption that workers are either risk-neutral or able to insure themselves against temporary income shocks. In reality, neither condition is likely to hold, and the uncertainty associated with job turnover is likely to figure importantly into worker welfare. We see the measurement of these globalization-induced welfare costs as an important avenue for further research. 1. In our model, the non-tradable sector includes low-skilled, self-employed jobs such as domestic services or street vending. This framework, in the tradition of Harris and Todaro (1970), is a realistic description of urban labor markets in many developing countries. 2. Relevant references include Mortensen and Pissarides (1999), Bertola and Garibaldi (2001), Hopenhayn and Rogerson (1993), and Helpman, Itshoki, and Redding (2010). 3. In our setting, cross-worker wage dispersion differs from cross-firm wage dispersion since firms are heterogeneous in size and wages are the same across workers within firms. The equilibrium change in cross-worker inequality is then determined by the change in wage schedule across firms as well as the shift in the firm-size distribution. In our experiments, the rightward shift in the latter offsets the increased cross-firm wage inequality by putting more workers into large firms. As a result, we do not find a significant effect on wage inequality across workers. Bertola, Giuseppe and Pietro Garibaldi (2001). "Wages and the Size of Firms in Dynamic Matching Models," Review of Economic Dynamics 4(2), 335-368. Harris, John R. and Michael P. Todaro (1970). "Migration, Unemployment, and Development: A Two-Sector Analysis," American Economic Review, 60(1), 126-142. Heckman, James and Carmen Pages (2004). "Law and Enforcement: Lessons from Latin America and the Caribbean: An Introduction," in Law and Employment: Lessons from Latin America and the Caribbean, edited by James Heckman and Carmen Pages, University of Chicago Press, Chicago. Helpman, Elhanan, Oleg Itskhoki and Stephen Redding (2010). “Inequality and Unemployment in a Global Economy,” Econometrica, 78(4): 1239-1283. Hopenhayn, Hugo and Richard Rogerson (1993). "Job Turnover and Policy Evaluation: A General Equilibrium Analysis," Journal of Political Economy, 101(5), 915-938. Melitz, Marc (2003). “The Impact of Trade on Intra-Industry Reallocations and Aggregate Industry Productivity,” Econometrica 71(6), 1695-1725. Mortensen, Dale and Christopher A. Pissarides (1999). “New developments in models of search in the labour market,” in (O. Ashenfelter and D. Card, eds.) Handbook of Labour Economics, vol. 3B, Amsterdam: Elsevier Science, North-Holland.